If hanging out with the witch all day long and terrorizing people walking down a yellow brick road sounds fun, then you probably have dreams of being a winged monkey from the Wonderful Wizard of Oz stories. Lucky for you, our Deluxe Winged Monkey Costume is perfect for you! If you are looking for the ultimate Halloween transformation well then, we've got you covered. No one, not even your friends will be able to recognize you once you turn yourself into an exact replica of those kinda creepy flying monkeys from the classic Wizard of Oz. Your costume comes equipt with a red vest with gold tassels and a red box-style hat . Now for the fun part, you will get a latex molded chimp mask, black faux fur chimp arm, chimp feet wraps for your shoes (yeah, we let you wear shoes, I mean you're not really an animal), a large set of black latex wings and a flexible tail accessory. 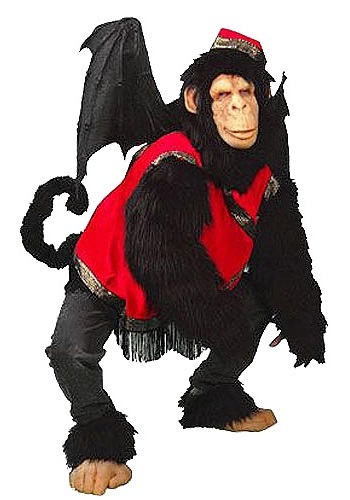 While we may not have magical powers that can turn you into an actual flying monkey, we do have this deluxe costume. So, like we we said, if you are ready to embody one of the coolest and slightly creepiest creatures of Hollywood history you're in the right place. All you need to do is put it on and obey the witch's commands. It's just that easy.